Review: “…A Kind of Life.” | Oh, The Glamourous Life! What a snowy Wednesday! How about a book review? Today’s book is continuing in the vein of Carnival Strippers, but it’s set in Boston! 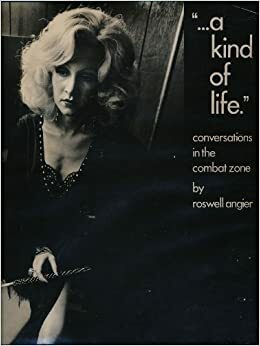 “…A Kind of Life.”: Conversations in the Combat Zone by Roswell Angier (1976). The Combat Zone* was the section of Boston where the adult businesses moved after Scollay Square was demolished. Washington Street between Boylston and Kneeland Streets was the home of peepshows, adult movie theatres, bookstores and venues such as the Teddy Bare Lounge, The Pilgrim Theatre, the Naked I with girls, girls, girls. Some of our Legends remember performing in those clubs and theatres. These days the Combat Zone is pretty cleaned up, although there are a few hold-outs (particularly on LaGrange Street, once notorious for the streetwalkers). Like Susan Meiselas, Angier took photos in the 1970’s of performers and others associated with The Combat Zone and accompanies the photos with quotes. His photos are taken on-stage, back-stage and on the street, all neatly captioned with the subject’s name (if known), location, and year. He also does an in-depth study of two performers: Melanie and Coty Lee. He seems to have a lot of affection for all these performers. For me the real selling point of the book, beside that it captures of Boston burlesque history, is a portrait of Tiffany Carter opposite one of Hedy Jo Star. The differences between the two are subtle and possibly specious. But to women who are in the business, the distinction is an important one. In part, it has to do with age. Strippers are often older women in whose memories burlesque is still very much alive, or younger women who have picked up the extravagant style of the old queens. They are real cockteasers. Showgirls, who tend to be younger, are less melodramatic. They get just as naked, but they are less genital. Their sexuality is polymorphous and familiar, a kind of aura. You can tell showgirls from strippers, sometimes by their stage names: Jeri, Deirdre, Melanie, Coty Lee; and on the other hand, Devil’s Delight, Satan’s Angel, Blaze Starr, Tempest Storm, Honeysuckle Devine. The effects they are calculated for are miles apart. An interesting perspective, which is contradicted by some of the performer’s quotes. The 70’s seem to be a time of transition for our industry and I’m interested to learn more. * One of my tag lines is “The Ivy League mind in the Combat Zone body”, but only particular audiences get the reference these days.